Stay Active and Independent for Life (SAIL) is a strength, balance and fitness program for aging adults. Performing exercises that improve strength, balance and fitness are the single most important activity that adults can do to stay active and reduce their chance of falling. 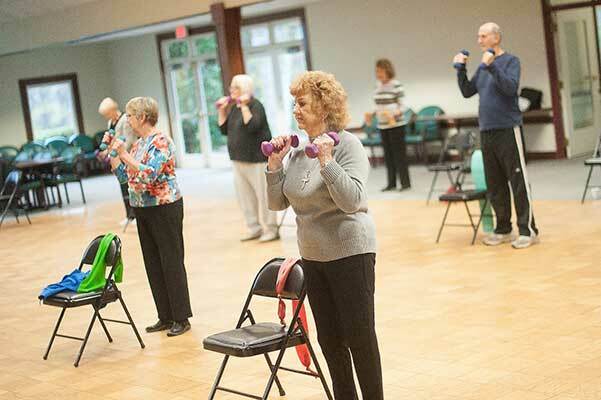 This exercise class was developed because of the Washington State Department of Health’s Senior Falls Prevention Study, which was funded by the Centers for Disease Control and Prevention. The entire curriculum of activities in the SAIL program can help improve strength and balance. Light weights are used, and all levels of fitness are welcome. Most of this class is standing but modifications are available for seated. This class will make you stronger, feel better, stay active and prevent falls. SAIL also administers the SENIOR FITNESS Test which is series of exercises that look at upper body, lower body strength and flexibility, balance, endurance and agility. Testing is performed the first and last day of class. 8’ Up-and-Go Test: Balance, Speed and Mobility. “Are you Ready to Exercise?” Evaluates participants current health on whether they should start or resume physical activity. “Barriers to Being Active” Series of questions that breaks down one’s barriers to exercise into 7 categories. “My Falls Free Plan” Asks questions about falling and gives recommendations for ways to talk to your health care provider. Tara Vroman is the fitness education specialist for Cobb Senior Services. She is a certified group exercise and senior fitness specialty instructor through the National Exercise Trainers Association (NETA.) She is also certified in the SAIL Fitness Program through Pierce College. Her background is in exercise science and currently teaches at the West Cobb Senior Center, North Cobb Senior Center and Senior Wellness Center.